Mbak Rully and my lazy cats. She 100% loves to cook and we are 10.000% love what she cooked. She loves our cats and my cats love her more than they love me! She loves to buy us good food and we love to buy her good things. She loves to hear my jokes and I love to hear her story. She loves us (I think) and that's because she knows we love her. Her name is Mbak Rully. Even she's 50 years old, I call her "Mbak", which it means she's younger than her age. She work at my house as a mother. Haha. 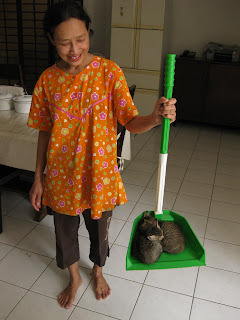 She cook, cleans, buys grocery, and taking care our cats with lot's of love. She do most everything what my family need to. When Idul Fitri came, she went back to her village. We are too damn affraid if she never came back to our house again. But tada! She came back! Bought us lot's of good food and a big smile. We're all very pleased to see her back. Even my cats look very happy that time when we saw her standing infront of our house. Well, usualy people call her maid, but I prefer to call her my family. I love her very much and I want people to know that, including her.